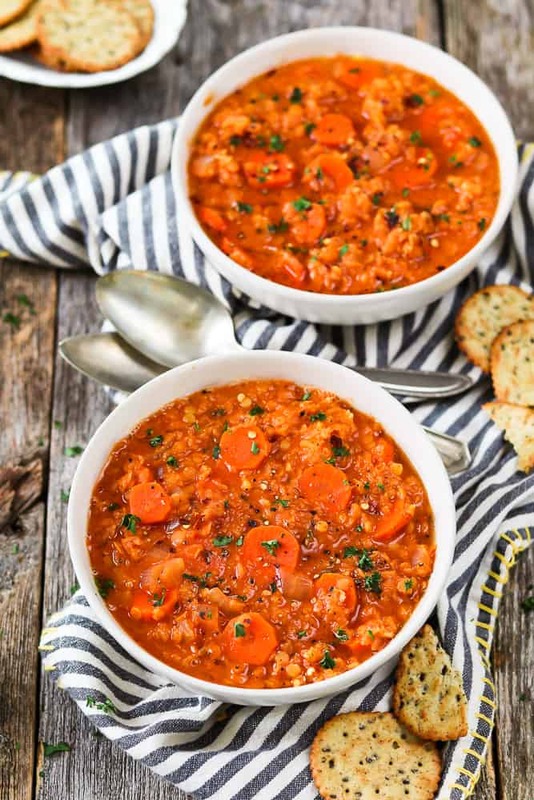 This hearty bowl of Hungarian Red Lentil Soup will be on your table in no time. It’s so easy to make and calls for simple, easy-to-find ingredients. It’s gluten-free and oil-free too! 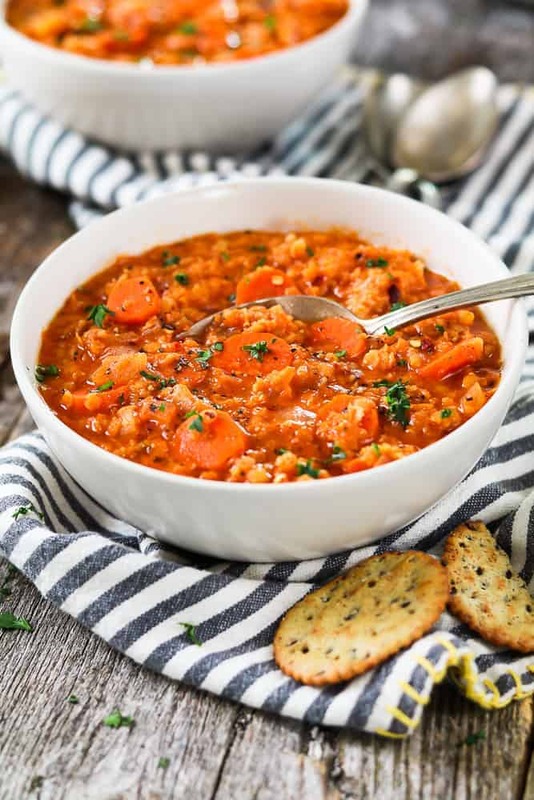 This Hungarian Red Lentil Soup Recipe is directly from the pages of The Vegan 8 cookbook by Brandi Doming. It’s a new family favorite! If you haven’t heard of Brandi’s blog, The Vegan 8, you’re in for a real treat. She has mastered the art of keeping recipes simple, yet satisfying and full of flavor. She uses no more than 8 ingredients for her recipes (not including water, salt & pepper) and they’re easy-to-find. Her recipes are all dairy-free and are mostly oil-free, gluten-free and nut-free too. Brandi’s recipes make it easy to eat healthy even with a busy lifestyle. Plus, they are designed for the whole family to enjoy. You’ll have a lot of happy campers at the table. Inside you’ll find 100 easy-to-make recipes that are simple and delicious. Each recipe accompanies a beautiful, drool-worthy photo too. It’s a total coffee table book! The cookbook is broken down into 9 scrumptious categories: Breakfast, Snacks & Appetizers, Lunches, Sauces & Dressings, Easy Entrées, Soups & Stews, Sides & Dips, and Staples. 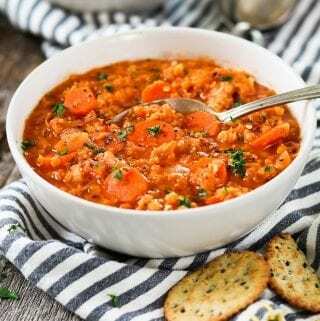 You’ll find mouth-watering recipes like Pumpkin Pie Crepes, Easy One-Pan Red Curry, Teriyaki Patties, BBQ Bean Ball Sub, Broccoli Cheese Soup, Creamy Cajun Lemon Sauce, Skillet Mexican Corn, Spinach Artichoke Dip, Showstopper Chocolate Cake, Chocolate-Peanut Butter Candy Bites, and this Hungarian Red Lentil Soup. I’ve already made a handful of Brandi’s recipes and I didn’t need to change a thing. The flavors and textures were all on point. I’m so excited to make some more. 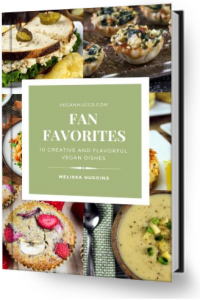 If you’d like to change things up in the kitchen, you should add The Vegan 8: 100 Simple, Delicious Recipes Made with 8 Ingredients or Less to your cookbook collection. You won’t regret it! STEP 2: Add the red lentils, Hungarian sweet paprika, tomato paste, dry mustard, salt, and pepper. and simmer on low for about 10 minutes. STEP 3: Add the lite coconut milk. Cook on medium-low for 5-10 minutes until soup slightly thickens and lentils are tender, but still firm. 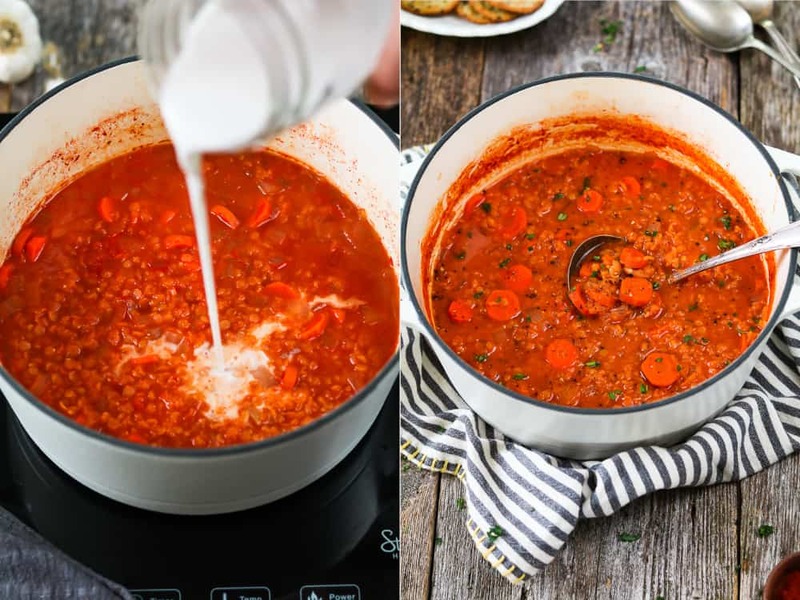 If you make this Hungarian Red Lentil Soup Recipe, let me know what you think by ★ star rating it and leaving a comment below. It would really make my day. You can also follow me on Instagram and share your creation with me. Just tag me @veganhuggs and hashtag #veganhuggs so I don’t miss it. Author: Brandi Doming / The Vegan 8 - Dinner doesn’t have to take forever. This recipe comes together fast, thanks to red lentils and easy ingredients. The Hungarian paprika, dry mustard, and tomato paste give this simple dish a wonderful depth of flavor. 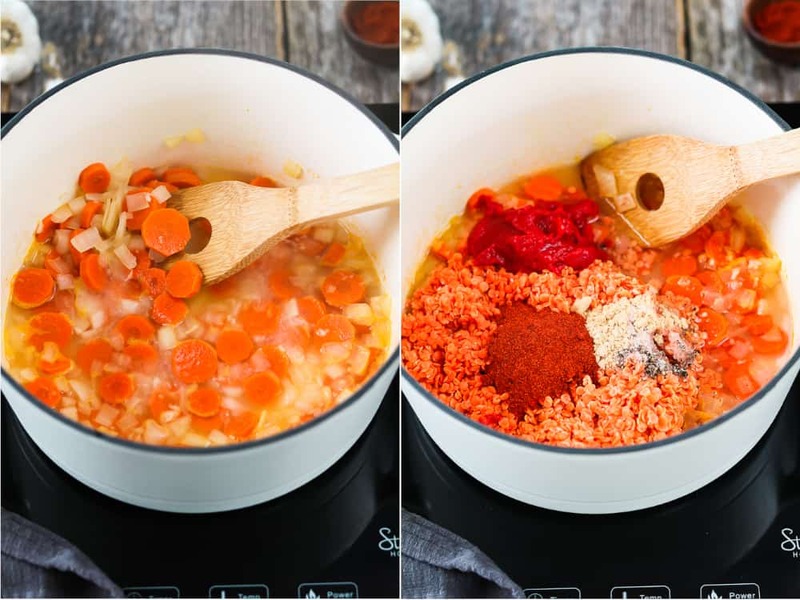 Add the onion, carrots, garlic, and 1 cup (240g) water to a medium pot over medium heat. Bring to a simmer, and cook for 8 minutes, stirring a couple of times during, or until the veggies are tender but not overly so. Remove the pan from the heat, and add the lentils, 2 1⁄2 cups (600g) water, tomato paste, paprika, dry mustard, salt, and pepper. Stir well, and bring to a boil over high heat. Cover, reduce the heat to low, and simmer for 10 minutes. Add the milk, and increase the heat to medium-low; cook 5 to 10 minutes or until the lentils are tender yet still firm, and the soup thickens some. Stir often, and do not overcook, as you don’t want the lentils to become mushy. Taste and add more salt, if desired. Serve immediately. Make sure the paprika you are using is not hot paprika. For the milk, it is important to use a creamy milk like cashew or “lite” coconut milk here for best results. The “lite” coconut milk is very creamy but yields no coconut taste. Almond and rice milks don’t do well, and definitely don’t use full-fat coconut, as it is too rich and thick and will ruin the flavor. Love this recipe. So easy and tasty, I make it regularly. Always a winner to share with family/friends. I made this last night and it was SO good! Even though I reduced the recipe to 1/3rd of its amount, I STILL have enough leftovers for lunch today! Served it up with a side of roasted Brussels sprouts in vegan butter with “bacon”…a quite satisfying meal that stayed with me the rest of the night! This one’s a keeper!!! Hi Dave! This is so awesome to hear! Thank you for making it and sharing your modifications. It sounds delish with the vegan sour cream. I haven’t found Hungarian paprika in local stores either. It really is the best! This looks absolutely amazing and delicious. I am trying this recipe this weekend to surprise my wife, however, I am going to add some organic potatoes that I just bought. Thank you for all the great recipes.